Dress code or good service? Radio Shack has answers! I remember when Radio Shack’s slogan was “You’ve got questions, we’ve got answers”. Based on the service I received back in the day, I used to joke that it should be “You’ve got questions, we’ve got questions” because of the unfortunate lack of information you could count on from a RS employee. I am glad to say that over the last few years, things have gotten a lot better, up to and including the experience I had today. When I entered the store, there were two people at the counter and two more behind them. Clearly the two at the counter were involved in a long transaction, and I heard Casey say to the two waiting in back, “Can I help you find something or point you in the right direction?” They were there for a cell phone battery, so Casey motioned them to another counter where he was able to assist both guests at the same time. When I was ready to check out, the same two people were at the counter, and Casey was still patiently helping them through some sort of cell phone upgrade/trade-in thing. You could tell by what he said that he knew the various plans and offers well. He saw me waiting and asked if I was ready to go. He motioned me to yet another counter where he started my transaction while in between calls and things he had to do for the others. When he saw what I was purchasing (a video cable), he smartly asked if I also needed the audio cable. I love it when people ask me questions that might save me a trip later. I didn’t need that cable, but I appreciate that he asked! He politely finished my transaction as he was carefully setting up the other customers’ phone. He was masterfully engaged in three transactions at the same time – it was a thing of service beauty! So what about this dress code thing? I mentioned that Casey looked to be in his twenties. If I had to guess purely on looks and appearance, I would say that Casey is a surfer, or at least he likes the beach. Longish blond hair, goatee, and from my apparently “old guy” perspective, his clothes were a little disheveled. As I related this story to my wife, she more correctly identified his appearance as “fashionable”. Ouch. So now the question of appearance vs. service comes to mind. If this interaction is the standard, I will take service every time. Casey was honest, genuine, well informed, efficient, thoughtful, proactive and personable. Did I notice his slightly disheveled yet fashionable look? Yes. Did I care? No. Would I go back to THAT STORE the next time I need something electronic? You bet! Many entertainment facilities (and non-entertainment facilities, for that matter) use the Disney look as the gold standard for employee appearance. It’s a squeaky clean, all-American, boy-and-girl-next-door sort of image. I am NOT saying this a bad thing, but thinking about this made me ponder 2 things: Is it still relevant today, and is it relevant in all industries? When the Disney look debuted, it was 1955 and Walt was trying to set his cast members apart from the carnies and unsavory types that most people associated with your typical carnival worker – and I think it worked. Fast forward to 2010… I think it’s a lot tougher to stereotype and say that someone is to be avoided, just because they have a tattoo. Things have changed. In Disney’s defense, they are about escapism, and I think that image works for them, but they are also a business who needs to hire people. They have recently changed their appearance guidelines to respond to shifting cultural norms. So here’s a question – has your dress code changed with the times? Are you trying to enforce a look that many (including your employees) may not even care about in your business? The big question here is about balance. Are you enforcing a dress code or set of appearance standards at the expense of paying attention to and reinforcing the SERVICE your employees provide? Casey may have been a bit “disheveled”, but his service was out of this world! If you’ve been following me on Facebook or Twitter, you know that I have just returned from Coaster Nerd Con 2010. The title sounds fancier than it is… this was just me and some other amusement park/roller coaster enthusiasts heading out for a walk in the park – or parks – as it so happened. 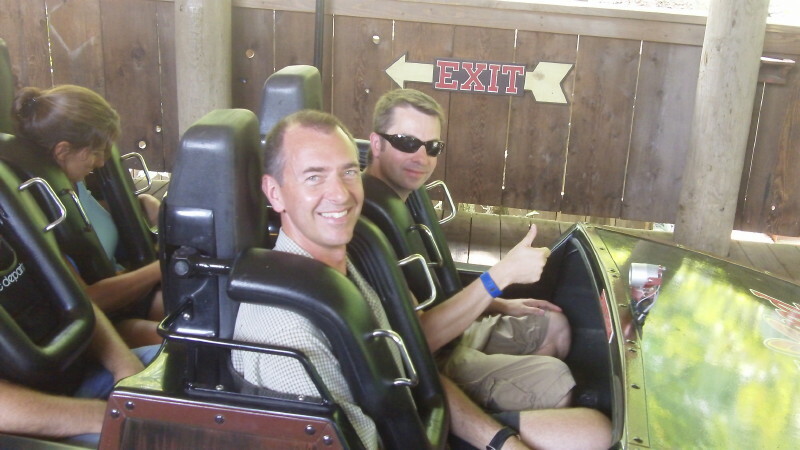 That’s Darren and Alan (with glasses) getting ready for a spin on the Tennessee Tornado at Dollywood. Our original plan was to hit Kings Dominion, Dollywood and Holiday World. None of us had been the last two, and KD had added a 305 foot tall menace called Intimidator 305. If you hadn’t heard, at the last minute Busch Gardens Williamsburg was added, and at the last-last minute, Kings Island was added. All in all we hit 5 parks in 7 days with many miles of driving in between – it was a BLAST! As I looked back at the trip as a whole, I thought of the things that will stick out most in my memory. Certainly the rides were great, but it was really the employees that made our visits special, and that is especially true of Busch Gardens, Dollywood and Holiday World. When I was first planning this trip, a friend who works at Holiday World told me, “we may not have the biggest park or the scariest rides, but we make up for it with heart.” Having spent a day in the “heart” of Holiday World, I would say he’s right. So what did these parks do so well? I think if I were to label the experience at all three parks it would come down to two words (or a word and a phrase): genuine and hassle-free. Even with some moderate crowds, we were able to make our way through the parks with relative ease. And in our interactions with employees, we felt like we were talking to real people. People who were genuinely compelled to help us and improve our experience. While all three companies are different, and are run differently, I would imagine there are some fundamental truths about their business model that makes them successful (and makes me want to write about them). They have values that they stick to. We were fortunate enough to speak to some great people from both Dollywood and Holiday World, and one thing was clear: they knew the company values and were serious about enforcing them. It’s one thing to have a poster or handbook that states what your company stands for, it’s quite another to have them rigorously enforced. One example is dress code at Holiday World – team members are required to wear plain white sneakers. When asked what would happen if someone came in with sneakers that didn’t meet the dress code, the response was a very confident, “they wouldn’t”. For some that might be hype, but based on everything else we heard and saw, it’s not hype here. By the way, all employees we saw were wearing plain white sneakers. We checked. They really put the guest experience first. At Dollywood, like many places around the country, it was HOT. On the tram from the parking lot to the front gate, the driver told us that Dollywood would be giving out free water to make sure we stayed hydrated. Sure enough, at the food stands they were filling up cups of ice water and placing them on the counter for guests to take just as fast as they could. It was refreshing (in multiple ways) to just walk up to a stand and grab some water. They also had fans everywhere! For guests and employees alike! Holiday World gives out water and soda as well, and have not only seen that money spent elsewhere, but have also seen a decrease in the number of EMS calls. They took away obstacles to service. At Busch Gardens, they have a system for avoiding long lines called Quick Queue. To me, most of these programs are simply glorified line cutting, and many systems around the country leave a lot to be desired. At Busch however, they have taken away one of the great dissatisfiers by not even allowing non-Quick Queue guests to enter the waiting area for the second row of a coaster train. They’ve set a clear expectation and this way, there is no need for an employee to have to explain to other guests that they will have to wait longer because someone who paid a little more is getting “special treatment”. That creates hostility among guests, which is usually taken out on the employees. To get back to our title, I think you have to lead with your heart to make the kind of decisions these companies have made based on the needs of their employees and guests. Like I said, we know that we rode some rides, but we’ll REMEMBER the experiences we had because the employees – employees who are successful because of the environment created by their leaders. As a leader, what are YOU doing to take care of your employees and guests? I’ve been hearing a lot of leaders talk about lazy employees lately, and was discussing this trend with my wife Linda, over breakfast today. 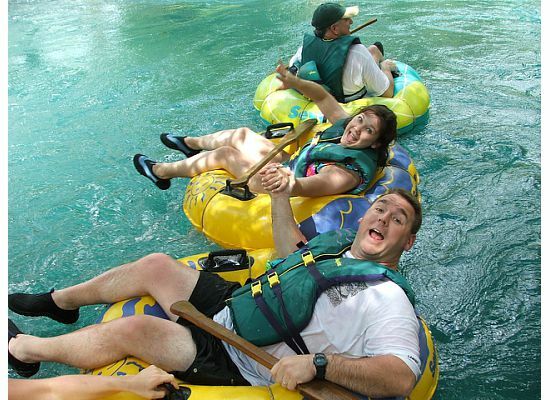 Somehow this turned into a dissection of our tubing trip down the White (lazy) River in Ocho Rios, Jamaica. 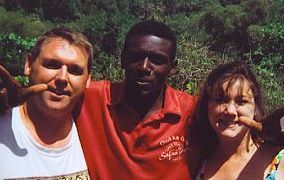 More specifically, it was about the behaviors of our guide, Otis. The more we talked about it, the more we realized that Otis was not just a great guide, he was displaying great leadership qualities – qualities that do not let employees fall into the lazy category. He got into the water with us. That might sound like a ‘duh’ for a tubing expedition, but looking back it set the stage for the entire experience. He helped us get situated, pointed us in the right direction and made us feel comfortable. He set an example. He kept us together. We were at the mercy of the currents, so every now and then Otis would come over to me and say, “where is your wife?” Not long after that, Otis would be dragging Linda or I toward the other. He helped us through the tough spots. The White River has some “rapids” that made the trip more fun and adventurous, but also a little more trecherous. Otis took the time as each person approached to tell them exaclty what to expect and how to handle it. Looking back, Otis could have simply put us in the water, wished us luck and waited for us at the end. While I think we would have made it to the end just the same, our outlook on the experience would have been vastly different. I think the same thing happens to our employees when we get them started on the right foot, pay attention to their progress and help them grow. They know that someone values them, and people are more inclined to work hard for someone that values them as an individual rather than a company that simply issues a paycheck. Other side of the coin – an employee is trained in their initial duties (even if trained well), but is never told how they are doing, given areas to improve or any positive recognition for when they really hit a home run. Utlimately, that person begins to think that no one values what they do, so they don’t value it either. Their performance slips and we call them lazy. When I first got into leadership I heard the quote that “as a leader, everything is your fault”. I know I will keep this, and Otis, in mind the next time I run across someone who might be “lazy”. When I heard there would be a movie created around one of my favorite shows from the ’80’s, I was excited. Some previous efforts to bring small-screen success to the big screen had flopped, but I was optimistic about this one. I finally got to see it the other night, and quite enjoyed this nostalgic-yet-updated version. Oddly enough, I also walked away from this experience with some tips on teamwork. (It is the A-TEAM, after all). Every team needs a leader with a vision (or in this case, a plan!). For the most part, this was Hannibal’s role. The team looked to him for direction and he gave it – confidently. However, he wasn’t too egotistical that he couldn’t let someone else have the spotlight, and in fact the “plan” the wrapped up the story came from Face. One team member’s problem was the whole team’s problem. B.A. developed a fear of flying (okay, so it was caused by Murdock, but that’s not the point). In countless ways, the team rallied around B.A. to help him get over the fear and get him flying again. Each person had a role that tapped into their strengths. Hannibal was the leader/idea guy, Murdock flies and drives things, B.A. is the muscle and Face is the schmoozer. Not everyone has to be good at everything, but they do need to see how they fit into the bigger picture. The had a shared goal. They wanted to clear their names and bring down the person who set them up. The goal was worth fighting for and just as important to each member of the team. This gave them the drive to give it all they had. The one advantage that The A-Team had was a script. The dialog, the action, the explosions, all choreographed for us to watch. In the real world, it’s probably not that easy. But it is do-able. Think about those 4 items above. Are you a leader with a vision? Have you communicated that vision to your teams so they have a shared goal? Do you know what the strengths are of your team members, and have you allowed them to use their strengths to help your business? Lastly, have you fostered an environment of open communication and trust in your teams so they help each other through the hard times and celebrate together when they win? Of course if you ask Hannibal, you’ll want to have a plan. And if you work it right, your plan will come together, too.